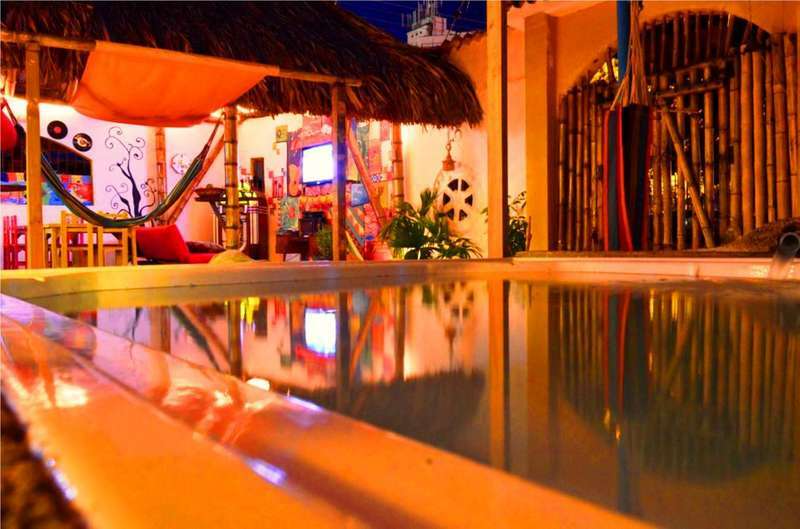 Casa del Ritmo is a place for friends, hosted by friends, the perfect setting for you to feel at home whilst being in the heart of the Colombian Caribbean coast. The hostel has the atmosphere of a house typical of the region. Bright and colourful, happy and a place for you to feel relaxed and comfortable where you can share good moments and traveling tales with your friends, whether new or old. We have for you to share and enjoy bikes, books, hammocks, sun loungers, a refreshing jacuzzi, games, TV area and free wifi. We have a lovely restaurant offering healthy, vegetarian food and our bar serves cool drinks and delicious cocktails where fun music is always playing! Everyday we have different activities to keep you entertained during your stay including: sunset yoga clases on the nearby beach, zumba clases, live music and open mic jam sessions, cinema and popcorn nights, poker nights, themed parties, bike tours and much much more. You can take a “door to door” shuttle by Marsol or Movilizate companies, which means that an air conditioning minibus is going to pick you up in your hostel in Cartagena and drop you off here, in Casa del Ritmo, for $42.000. You can also take a public bus to Santa Marta, in the bus terminal, in that case, ask for more details in your hostel in Cartagena. This property has a 1 day (24 hours) cancellation policy. Cancellation Policy: 24 hours before the arrival.